Proactiv contains an entire line of products that help its users get clearer, fresher looking skin and has been endorsed by countless celebrities including Jessica Simpson, Katy Perry and Julianne Hough. Their most popular product is without a doubt their 3-step kit that includes Proactiv Acne Wash, Revitalizing Toner and Repairing Lotion. We're going to take a deeper look at the two Proactive facial cleansers that are available which include the Proactiv Solution Original Renewing Cleanser and the Proactiv Solution Deep Cleansing Wash.So you can choose the best Proactive facial cleanser for your skin! Proactiv acne wash is formulated for those who are suffering from acne blemishes. Acne can be very embarrassing and it can greatly reduce self-confidence and self-esteem as well. Clearing up the skin is as easy as using the right products for the job. This Proactiv acne wash is perfect for anybody suffering from acne. Anybody can use it including teens and adults who have stubborn acne. It provides a deep cleaning in order to get rid of skin impurities that can cause breakouts and lead to new acne breakouts. 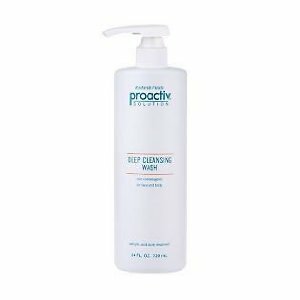 This cleanser is recommended for occasional use when you just feel like you want an extra deep cleaning. Your skin will feel refreshed and revitalized. The cleanser itself contains ingredients that will help slough off dead skin cells which can blog pores and cause pimples. It doesn't irritate the skin because it also contains ingredients that are used to calm the skin to prevent any irritation. The magic ingredient in this formula that fights acne is 2% salicylic acid. This product is getting an average of 4.5 stars out of a possible 5 and that's after counting dozens of reviews. "I have been using this for years, and it is the ONLY product that keeps my face clean and blemish free." "If proactiv products hadn't cleared my face, I was ready to go shell out the money to have my face zapped again." 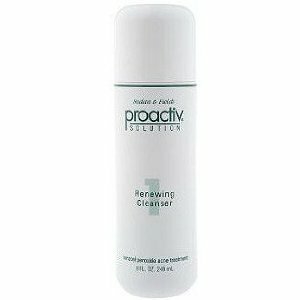 Proactiv Original Renewing Cleanser can be used by anybody who suffers from acne. Even if you don't suffer from severe acne or you don't get acne at all, it's still a superb cleanser that will improve the look and feel of your skin. For best results, this product is to be used twice daily. Once in the morning and then again at night. It's an oil-free formula that cleanses the skin and washes away dead skin cells to improve skin's texture and prevent future breakouts. This Proactiv acne wash also gets 4.5 out of a possible 5 stars and reviewers have great things to say about it. "I've tried several skin care lines for my adult, oily, acne prone skin. All of them compared themselves to Proactiv. I say why bother with the wannabes when you can have the real thing? Proactiv is still the best." "This is the product I dreamed of in my teens! I have used it for a year and each time I stop, my face goes back to the hormonal, oily mess I had in my younger years...this is truly a miracle product!"